Check Out the Crazy Pirate Slots Now: Ahoy Me Hearties! The great thing about slots games and new technology is that some of the best games don’t have to be played on your computer. If you have an iPhone you can download and play the great Crazy Pirates Slots game now to see whether you’re able to win a superb prize. With great features and exciting gameplay there’s no doubt that it is a scream to play. There are just three reels in the game and just one payline, but it is designed to look like a piece of rope stretched from one side of the screen to the other! It is superb fun as you’ll see. You can wager anything from one to ten coins on each spin of the reels. You’ll see the plus and minus keys on the left side of the screen that will enable you to adjust the amount accordingly. Yes there are, but the best way to figure out the game is by playing it. You tap the reels in turn to stop them, and if you see a figure you need to tap it again to get the benefit. This happens with the skulls so watch out for them because you’ll get extra coins if you tap fast enough! Look for a parrot to appear on the reels and hit it with your finger and you’ll trigger a bonus game to be played. This takes you into a bonus round where you can try and Hit the Ducky to get more coins. You might also be prompted to get three coins in a row on the spinning wheel – but make sure you avoid the skulls! 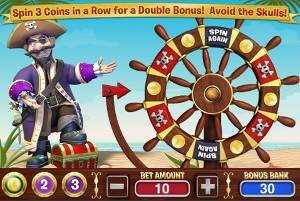 Download and play the Pirate Slots today! The great news is that you can download and play pirate-themed slots like Goldbeard Slots in the lite version for free, or you can pay for the full version. It’s up to you. The lite version has plenty to keep you occupied though, so try it first and see whether you want to upgrade from there. With great reels packed with features and symbols and coins to wager on each game, you’ll be glad you found Pirate Slots and waged a bet against those pesky pirates!